OK. For almost 3 weeks in a row, I have been raving about a single topic – sampling. Couldn’t help it, as I seem to be (inadvertently) running into very interesting examples from around the world and across categories. Latest case in point, an interesting execution of ‘targeted sampling’. Reports suggest that every year nearly 1 Billion USD is sunk into food sampling alone. So with ROI measures becoming ‘make or break’ metrics for most marketing initiatives, it is imperative that sampling also follows suit. Therefore an interesting challenge in sampling is: how do you reach out and cater exclusively to your target. For eg, for an ‘adults only’ products (like Alcohol, Cigarettes, X rated stuff etc), how do you ensure that the recipients of the free samples are almost only adults? Solutions indeed come from the most unexpected quarters. This time it is the category of, believe it or not… pudding! 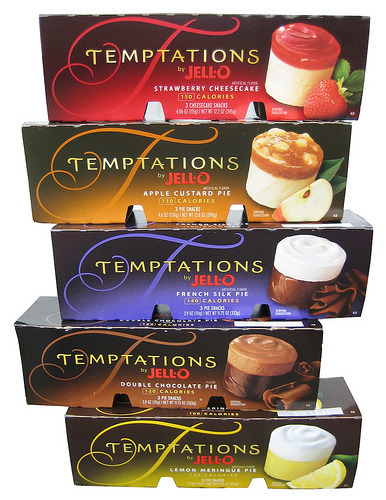 The story goes that Kraft has launched its line extension of Jell-O ‘just for adults’, under the name Temptations. What separates it from the regular Jell-O variants is that it is low in calories (the copy actually says “150 well behaved calories or less”) and available in 6 different flavors like Lemon Meringue Pie, Apple Custard Pie, French Silk Pie, Double Chocolate Pie, Raspberry Cheesecake, Strawberry Cheesecake. Now, line extension to a target group that is not your regular base can be challenging. So how did Kraft try to pique the interest of ‘adults’ regarding a product that they had only known as kids? Well, certainly a well executed TVC was very much in their arsenal. While the TVC arguably does a good job at making ‘adults’ (and I would bet, more kids than adults) sit up and take note; and in a number of instances peaks their curiosity just enough to merit a purchase, how do you take this to the next level at the last mile ‘the point of purchase’? Sampling, of course. Essentially the camera in the vending machine scans the user’s face and calculates the distance between the user’s eyes, ears and nose to categorize him/her as a kid or an adult. While this approach might not be 100% fool proof in all cases, it is certainly a remarkable marketing initiative – for a number of good reasons. The following video shows the interaction in more detail. While being positively hilariously and deliberately tongue in cheek in its approach, I have a feeling that Jell-O successfully crosses the chasm and cements that bond with their new target group. Extending to new target groups can indeed be challenging, interesting and sometimes frustrating. Reminds me of Lego’s recent bid to woo girls, AXE recent foray into deos for her and the brilliant examples of Harley Davidson’s targeting of women bikers. But more about these cases in a later post. Do you know of any interesting instances of brands extending to the “other 50%”? This entry was posted in Uncategorized and tagged Adults Only Sampling, AXE, CP+B, Food Sampling, Harley Davidson, Intel, Jello-O, KraftFoods, Lego, Targeted Sampling, Temptations, Women Bikers. Bookmark the permalink.